This is to inform that I will be away from 18th January to 5th February 2008. Read about my adventure in Istanbul here. Wishing everyone a Prosperous Chinese New Year! I believe he is one of the many that is making ends meet. A Secretary in office told me about a cheap and good seafood steamboat near my work place that is the 'Singapore Post Centre' at Paya Lebar MRT. Hence, yesterday evening after work I was there with other WP comrades. I would say that its really value for money. Each pax is $9.90 with soup base at $5, you have a wide variety of food to choose from and should you have 4 or more pax, per table is entitled to free crabs, ready to eat ones :) Will definitely go back again. By the way, its Eunos Ave 7 Road, Block 26. After spending about 2 hours there, I headed back home with Swee Bee to collect a mega luggage that I will be borrowing from her and of course with that luggage I took a cab home. I flagged for a Comfort Delgro cab, with the signage Punggol on it. In other words, this driver is heading towards Punggol and will probably not take any passengers that is not on the way. Despite seeing me with the luggage, he stopped the cab and ask me for my destination before I board it. 'Uncle, dont worry its Buangkok Crescent that I'm going....not airport,' I assured the driver as I got on the cab. He turned back his head and smiled at me before driving off. 'Actually if its airport, I will still drive you there and then go back home to Punggol, I need money.... but I have been driving since 5am this morning and I am getting very tired,' the driver who is in his late 40s said to me. He owes Comfort Delgro near to $1000 of rental fees. I looked at the clock in the cab, its 11.35pm. He had been working for 18 hours and I believe its his daily weekday routine. During the weekends, he has a relief driver. Apart from driving for a living, he has to fetch his wife to the hospital everyday for physiotherapy. She suffered from stroke 3 years ago. Doctor had told the family that there is no way she can recover, nevertheless they did not give up. With constant care and physiotherapy session she can at least walk with crutches now. To make matters worse, his wife's family choose to ignore their problem and had never contacted since then. I cannot help but asked him about his children...hoping that they are big enough to help support the family. Unfortunately both boys are still in their teens, a 2nd year Diploma student and the younger one in Secondary 4 this year. This driver is the sole-bread winner of the family. He needs to provide financial support as well as moral support for his wife. Not only that, he has to play the role of both mother and father to his 2 boys. Fortunately due to his wife's condition, their mortagage insurance paid off their housing loan and hence that is one less burden. However, he can still barely make ends meet. Of course, he can barely make ends meet... school fees, daily expenses, medication, consultation fees, electrical bills, cab rental, diesel, etc...not to mention the government is making the two ends even further to meet. He was telling me his schedule for the next 2 weeks before Chinese New Year. He had to work long hours and on New Year's Eve, he will have to cook and after eating reunion dinner, he has to continue driving again. Unlike others who will be doing visiting, he will drive and his family will be at home, waiting for him. When I reached my destination, the fare came up to $4.40 I gave him a $5 and got him to keep the change. He looked back at me and that was when I got to really see him clearly because the lights were on.... slightly greyish hair, slim-built, a very humble looking man. 'Thank you and happy holiday,' was what he said to me. 'Go home and rest, your family needs you,' I replied. Got this from careerbuilder.com. Rachel Zupek, the writer and blogger for careerbuilder.com, researches and writes about job search strategy, career management, etc, came up with the list below. 1. Salary informationWhat you earn is between you and Human Resources, Solovic says. Disclosure indicates you aren’t capable of keeping a confidence. 2. Medical history“Nobody really cares about your aches and pains, your latest operation, your infertility woes or the contents of your medicine cabinet,” Lopeke says. To your employer, your constant medical issues make you seem like an expensive, high-risk employee. 3. GossipWhomever you’re gossiping with will undoubtedly tell others what you said, Solovic says. Plus, if a co-worker is gossiping with you, most likely he or she will gossip about you. 4. Work complaintsConstant complaints about your workload, stress levels or the company will quickly make you the kind of person who never gets invited to lunch, Solovic warns. If you don’t agree with company policies and procedures, address it through official channels or move on. 5. Cost of purchasesThe spirit of keeping up with the Joneses is alive and well in the workplace, Lopeke says, but you don’t want others speculating on the lifestyle you’re living –or if you’re living beyond your salary bracket. 6. Intimate detailsDon’t share intimate details about your personal life. Co-workers can and will use the information against you, Solovic says. 7. Politics or religion“People have strong, passionate views on both topics,” Solovic says. You may alienate a co-worker or be viewed negatively in a way that could impact your career. 8. Lifestyle changesBreakups, divorces and baby-making plans should be shared only if there is a need to know, Lopeke says. Otherwise, others will speak for your capabilities, desires and limitations on availability, whether there is any truth to their assumptions or not. 10. Negative views of colleaguesIf you don’t agree with a co-worker’s lifestyle, wardrobe or professional abilities, confront that person privately or keep it to yourself, Lopeke says. The workplace is not the venue for controversy. 11. Hangovers and wild weekendsIt’s perfectly fine to have fun during the weekend, but don’t talk about your wild adventures on Monday, Solovic advises. That information can make you look unprofessional and unreliable. 13. Off-color or racially charged commentsYou can assume your co-worker wouldn’t be offended or would think something is funny, but you might be wrong, Solovic says. Never take that risk. Furthermore, even if you know for certain your colleague wouldn’t mind your comment, don’t talk about it at work. Others can easily overhear. This is normally the time of the year whereby people start to do some job searching. Why this time? Probably because most of us had gotten our bonuses and are looking for better opportunities out there. The WP Youth Wing first event for 2008 is to spread the warmth and joy of the upcoming festive season to the needy, a charity drive, which will stretch for 6 weeks. Distribution of flyers to both residents of Seagull Walk and Kovan Road takes up two weeks. Collection from these 2 areas will take another two weeks. Sorting of collected items and finally delivering them to the beneficiary is another week. It was indeed very rewarding...especially under the hot, scorching sun this afternoon and not forgetting the relentless barking from some dogs. Seagull Walk which is right behind SIA Training Centre, consists of 4 lanes with 2 stretches of houses in each lane. We had 5 vehicles all fully packed after finishing the first 2 lanes. They had to make a trip to the store and come back again for the last 2 lanes. Although not all units contributed, however we've got feedback such as...its great to see you people doing this on a weekend! Such comments really make your day. All donated items will be distributed to Childrens' Home, Old Folks' Home and the Salvation Army. And lastly, to all residents of Seagull Walk, sorry to disturb your afternoon nap and thank you for the donations. Yes, that was my first reaction when I read the above from Today online. Why pay for somebody else's mistake? Mdm Lee Ah Muey was made to pay for a mistake that wasn't her mistake. 4 years ago, she was given 3 choices; give up her shop, re-locate to a new location or re-locate to a temporary market. Her daughter persuaded her to give up the shop, get the compensation and probably retire early since her 5 children can support her. If I were Mdm Lee's daughter I would probably had given her the same piece of advice. And now, 4 years later, HDB is saying that they made a mistake in the pay-out to Mdm Lee. Hence they are now DEMANDING her to pay back this sum of money. Yes, DEMANDED was the word used in the letter to Mdm Lee. Both NEA and HDB claimed that they tried contacting Mdm Lee in 2004 about this mistake but could not get her. Is our national system that back-ward? A big government body like HDB is not able to track a person down? And in 2004 was the year that the compensation was paid out. In less than a year, HDB could not contact the person? And like what Mdm Lee's daughter had said, a mistake had been made, but why it took so long? Why are there no alternatives given to Mdm Lee? Well, if I were Mdm Lee's daughter, I would probably go....why should I be made to pay for a mistake that its not my mistake in the first place? Or maybe I should be thinking, luckily HDB did not charge me interest. The spokesperson from HDB indicated that Mdm Lee did not express any difficulties in repaying this amount of money when contacted in Sep last year. Does that means that she is in the wrong? So she has to pay within 21 days because she did not indicate? She might not even know what the letter was all about! Yes, the contract that Mdm Lee signed cited that no compensation will be made should she decided to give up her stall. However as stated, this agreement was made and signed in 1993. The mistake took place in 2004...that is 11 years apart! Is there a possibility that there was a new contract of compensation after that? I'm definitely not as well-versed in law practice as Lawyer Kirpal Singh who commented that...if the woman can show she is no longer in possession of the monies or is no longer in a position to return the monies — for example, if she is bankrupt — then the claim would be defeated. May I ask, besides declaring bankrupt which is the last thing one wants to do, what other ways can one show that he/ she is no longer in possession of the monies? Its really amazing that our bureacracy can admit making a mistake and yet demand an old woman, age75, to pay for their mistake. They are mainly in the heart of residential areas. MOTORISTS can expect to pay more over the next few months to use the roads when five new ERP gantries are up, many in the heart of residential areas. The gantries are in Upper Bukit Timah Road (outside Hume Park), Toa Payoh Lorong 6, Upper Boon Keng Road, Kallang Bahru Road and Geylang Bahru Road. All except the ones in Toa Payoh Lorong 6 and Geylang Bahru Road have been completed. The Land Transport Authority has not announced when these new gantries will be switched on, but already residents are concerned why their neighbourhoods are targetted. 'My feeling is that it will just redistribute traffic around,' the director of a statutory board added. Toa Payoh resident 68-year-old retiree Tony Chan wanted to know why the gantry at Toa Payoh Lorong 6 is sited near the entrance to the residential area. The LTA spokesman explained that the location of the gantry is unlikely to affect residents as it charges motorists entering into Toa Payoh from Braddell Road who add on to the traffic in the area. He added that if gantries were at exit points, more Toa Payoh residents would be affected. Also it would plug a gap in series of gantries forming an outer cordon around the city. The new gantries are part of the LTA's plans to have an 'outer cordon' to control traffic going into the city. The Pink Ribbon has great news--they've partnered with Yahoo! Search to create LookPink.com--a search engine with world-class search results that contributes its revenue to Breast Cancer Research. Every time, you search with LookPink.com, you help fight against breast cancer! I had changed my homepage, you should too! P.S. Help fight breast cancer now - spread this message to your friends and family immediately. One person! can make a difference, but a group of many can change the world. Sign up to receive a monthly email reminder to do your monthly self-breast examination. Early detection of cancer is critical, and monthly self-breast exams are vital to a women's health. I guess the next thing for cabs could be 'Tipping' System??? AS MR A.L. Tan's cab comes into sight, an A4-size handwritten sign on his dashboard is what a potential passenger will see first. 'Not 35% surcharge peak hour', it says. He has resorted to waiving the surcharge after last month's cab fare hike. Cabbies complain that passengers are disappearing during morning and evening rush hours. What used to be a $2 flat surcharge for travelling between 7am and 9.30am, or 5pm and 8pm, is now calculated as 35 per cent of the metered fare. A passenger travelling from Ang Mo Kio MRT station to Choa Chu Kang's Lot 1 Shopping Centre pays about $14 outside peak periods. Slap on the surcharge during peak hours and the fare is now $19. Although cab companies are optimistic that the recent fare changes will raise drivers' incomes, cabbies themselves are not so sanguine. Most of the 20 cabbies The Sunday Times spoke to say that passengers are more receptive to the 30-cent higher flag-down fare, but baulk at paying the peak-hour surcharge. Of the 10 passengers The Sunday Times spoke to, seven said they now avoid taking cabs whenever possible, especially during peak hours. The others said that they still take a cab at least once a day. Property agent A.C. Yeo, 54, said she now takes the train to work instead. A cab ride from her Bishan flat to her office in Toa Payoh used to cost her $6.50 during peak hours. Now, it has gone up to about $8. To encourage more passengers to catch taxis during peak hours, some cabbies such as Transcab's Mr Tan have come up with their own strategies. Comfort cabby B.P. Pang, 52, is giving out discounts together with his business card in the hope of increasing his passenger base. For a $27.40 trip from Tampines to Cecil Street, including peak-hour and Electronic Road Pricing surcharges, Mr Pang charges his passenger $21, giving him a 23 per cent discount. He usually gives discounts only to customers whose fares exceed $20, in the hope that they will call for his cab in future. 'I used to get at least six customers during peak hours, now I don't even get two,' said the cabby of three years in Mandarin. Even with his new tactic, Mr Ng says he takes home about $80 a day, a 30 per cent dip from before. But he is optimistic that business will pick up as more customers are asking for his phone number and calling him when they need rides. Sales manager Maria Woo, 35, for example, has become Mr Ng's regular passenger, ringing him for a ride during peak hours. She takes a cab at least five times a day for business meetings. 'He doesn't charge me the 35 per cent and the on-call charges, saving me up to $65 a week!' she said. Asked if it was legitimate for cabbies to offer customers discounts, a spokesman for Comfort, Singapore's largest taxi operator, said that cabbies are essentially their own businessmen. While some cabbies are fighting the passenger drought, others are using the lax period to take longer breaks at coffee shops. Comfort cabby D. Ghing, 60, said cabbies are now trying to 'out-drive' each other for passengers. SINGAPORE: As scores of Singaporeans greeted the New Year with feasting and revelry, one was marking it by beginning a five-day fast outside the Malaysian High Commission here. 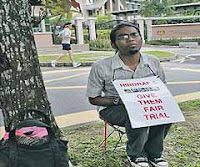 In a statement to the media, local artist and activist Seelan Palay, 23, said he was fasting in his "personal capacity" to call for world pressure to be brought on the Malaysian government to release five Hindu Rights Action Force (Hindraf) leaders, known as "Hindraf 5". They have been detained in Kuala Lumpur since Dec 13 under Malaysia's Internal Security Act. "Each day of my fast is in dedication to each of the five detainees," the activist said in his statement, which has been reproduced on several blogs. Mr Palay, who plans to ingest nothing but water until Friday 9am, is no stranger to controversy. He was arrested during the International Monetary Fund and World Bank meetings here in 2006 for trying to distribute a fact sheet. When TODAY dropped by on Tuesday, Mr Palay was seated on a stool under a tree opposite the entrance to the High Commission. Looking a little tired but in good spirits, he said he had been moved to act when he witnessed firsthand the protests in Kuala Lumpur. He was filming the rallies on Nov 25. He said he would try to hand his statement to the Malaysian High Commissioner today. On Monday, the High Commission staff had taken photos and a video of him, he said. "The police asked me for a permit, warned me and told me to disperse. But I am only fasting, why should I need a permit? They said it was under some public entertainment licensing law, and I said I was not here to entertain anyone," said Mr Palay. The police told TODAY that it was looking into the matter. Mr Palay said news of his actions has reached some Malaysians, who visited or called him. Singapore Democratic Party assistant secretary-general John Tan, too, paid Mr Palay a visit. When asked, Mr Tan said he was there to "offer support" and "keep (Mr Palay) company".